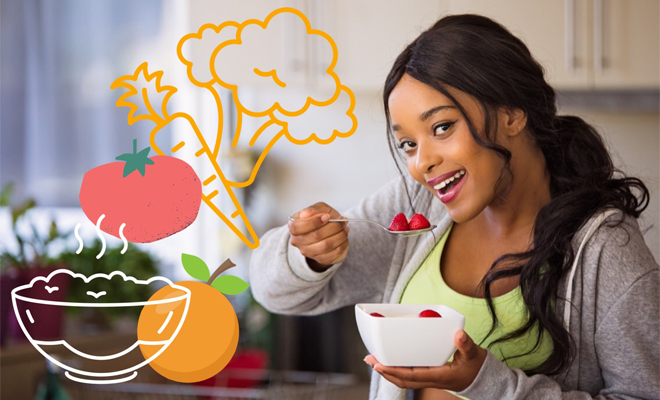 BeautySouthAfrica - Skin & Body - It’s confirmed – a healthy diet means better skin! It’s confirmed – a healthy diet means better skin! By now we all know the importance of feeding our skin with good quality products that hydrate, nourish and protect, but how much attention are we paying to the food we eat? If you’re still reaching for that takeaway (late night cheeseburger, anyone?) you may want to reconsider. Not only is fresh, healthy food essential for a healthy body, but it goes a long way in improving the quality of our skin. It turns out Mom was right – eating all your veggies really does pay off! The right nutrients can vastly improve the clarity of your skin (goodbye, nasty blemishes) while increasing radiance and a youthful glow. But in a world filled with fast foods, where can you start? Say hello to your new best friends – fresh fruit and veg. These are filled with powerful antioxidants that protect the skin from free radicals (these are molecules in the air caused by the likes of pollution and cigarette smoke – yikes!). Free radicals cause cellular damage to the skin, which means more wrinkles, faster! At least five portions of colourful fruit and veg per day are needed to help fight off free radicals and give your skin that sought-after glow. But be patient – it can take up to six weeks before you see the results. A healthy diet isn’t the only factor that comes into play, but when combined with a solid skincare regime and healthy lifestyle, it’s a game-changer! Keen to know more? You can consult your nearest Skin Renewal about getting your health and skin on track, or visit our Ask The Experts section to get your burning questions answered by a doctor. This post is sponsored by Skin Renewal. I love this! Since your skin is practically your makeup base, it makes caring for it is so important – and the best way to do so is by nourishing it from the inside. I agree with the nutrients listed and also add that plenty of water helps keep skin healthy and hydrated.